The Times Herald-Record recently reported on a tractor trailer rolling over with a load of more than 45,000 pounds of oranges. The truck driver told law enforcement that as he was rounding a curve heading into an exit when he felt his load shift, causing the truck to leave the roadway onto the shoulder where it overturned. There were no reported injuries and clean-up crews spent many hours offloading the trailer. Our Boston truck accident lawyers find this story interesting in light of two bills in Congress involving semi truck weights. The Coalition for Transportation Productivity is strongly in favor of SETA (Safe and Efficient Transportation Act), a bill that would give states the option to increase truck weight limits from 80,000 pounds to 97,000 pounds for six-axle vehicles. The group says requiring a sixth axle would maintain braking capacity and weight distribution, and minimize road wear. It also mentions the increase in user fees could be used for bridge repair. They also think that with fewer trucks on the roads, motorists would be safer. The Teamsters and safety advocates are fiercely opposed to SETA and support SHIPA (Safe Highways and Infrastructure Preservation Act). This bill proposes that it would leave the current weight limits in place. They argue that the heavier trucks would accelerate road wear and tear, and that our bridges wouldn’t be able to handle the loads. They counter that longer and heavier trucks would be much harder to stop and require a lengthy distance to come to a complete halt on our overcrowded roadways. Currently, an 80,000- pound truck traveling at 55 mph takes 400 feet to stop on perfect road conditions. Earlier this month the National Transportation Safety Board (NTSB) held a two day forum in Washington D.C. that focused on truck and bus safety. One idea that is being considered to decrease driver fatigue is to limit driving hours to 10 a day. 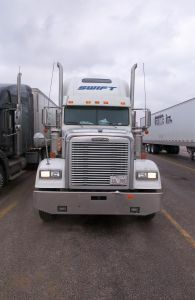 The current limit is 11 hours in a 14-hour work day, and truckers can drive 70 hours every eight days. The Boston injury lawyers at the Law Offices of Jeffrey S. Glassman, LLC are dedicated to fighting for the rights of victims and their families in Massachusetts. Contact our experienced team if you have been injured in an accident by calling 1-877-617-5333 to set up a free and confidential consultation to discuss your rights.